Durham University has chosen AV integrator ProAV and digital media specialist Tripleplay to supply a digital signage and IPTV solution for use in its business school premise. 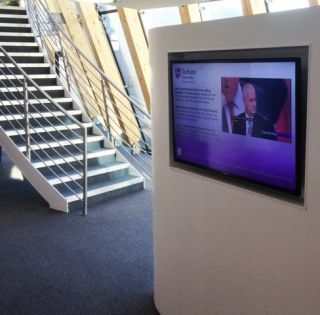 At present the solution consists of 15 screens of signage around campus showing a mixture of IPTV, RSS feeds, news, and live travel information for staff and students. Tripleplay solutions are in use at a number of Universities around the world including Trinity University, San Antonio, USA, La Trobe University, Sydney, Australia, Sheffield Hallam University and London School of Economics in the UK.